Think of ancient weapons in Japan, and the first thing that comes to mind is the gleaming Samurai sword, honed to razor-like sharpness. The matchlock arquebus is almost certainly the last thing you would associate with Japan. Yet Yone Zawa, an old castle town set high in the mountains of Honshu, the country’s largest island, can boast a unit of matchlock fusiliers. 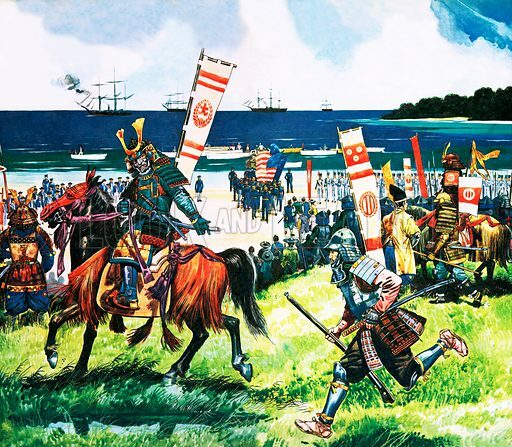 The story of Japan’s matchlock militia began in 1543, when Portuguese traders landed on Tanegashima, a small island lying off the southern tip of the main island of Kyushu. They brought with them trade, Christianity – and the matchlock. The Japanese warlords had never seen anything quite like it before. They bought several from the Portuguese, and had them carefully copied. A century later, the Japanese decided that they had had enough of Western influences, and ended all trade with Europe. This state of affairs was to last until 1854, when the American sailor, Commodore Perry, brought a flotilla of gunboats to Japan and forced trade upon the country. To his amazement, Perry found that some of the Japanese troops were armed with a collection of beautifully made and highly accurate matchlocks. During the centuries of isolation, they had redesigned the matchlock into a long and slender gun, often carefully carved and inlaid with silver. Not far from the centre of London lie two districts called Islington and Camden Town. Here, during the early part of the 19th century, row after row of harmoniously proportioned houses were built to house the workers of the City. Today these houses, with their large, airy rooms, are anxiously sought after by house-hunters looking for a home with some character and period charm. But when Walter Sickert painted these streets towards the end of the 19th century, they had gone down in the world, seemingly never to rise again. The plaster was falling off their elegant facades; many had been converted into lodging houses, and now contained several families instead of one. What light filtered through their fly-blown window panes only served to illuminate dreary lodgings, a table perhaps, and a bed and a chair. These rooms, with the garish music halls which their inhabitants might occasionally visit, were to form the subject matter of Sickert’s most famous paintings. The sordidness of the scenes he chose to paint did not worry Sickert, although his critics objected to his work on the grounds of vulgarity, and the low-class origins of his sitters and their locations. To Sickert, the background of the people and places he painted was irrelevant – he was mainly concerned with the forms they took and the effects produced by the light that fell on them. Sickert has been called “an English Impressionist”. But he was only “English” up to a point – he would be better described as a European. Walter Richard Sickert was born in Munich in 1860. His father was an artist of Danish extraction, while his mother was Anglo-Irish. In 1868 the family moved to England. At first the young man wanted to be an actor. For two years he trod the boards at provincial theatres up and down the country. By 1881, however, he had become disillusioned with the acting profession and had set his heart on becoming a painter. That year he enrolled at the Slade School of Art, where he soon met one of the leading painters of his day, James McNeill Whistler. Whistler was then at the height of his creative powers, but so far had received little in the way of recognition. He had already painted several masterpieces by the time he took on Sickert as an assistant. Lack of critical appreciation had turned Whistler sour. He took his revenge on critics by lashing them with the sharp end of his tongue, which few people could match for sheer invective. 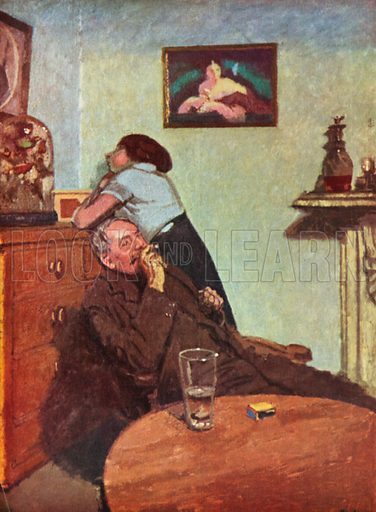 Sickert, with his good looks, his actor’s eye for cutting a fine figure, plus, of course, his “non-Englishness” (Whistler was an expatriate American) would have greatly appealed to the rebellious artist. In Whistler’s studio, Sickert did everything – cleaning the Master’s brushes, helping him print etchings and mixing his paints. All the time he was learning from a modern master. A year later, the chance came for him to meet another one. As the luxury liner Santa Maria sailed out of Lisbon at the beginning of January, 1961, her 600 passengers – including children from Portugal, Spain, and South and North America – looked forward to a month of uninterrupted shipboard fun and enjoyment. They were going on a costly winter cruise, which would take them to the West Indies, Brazil, Florida, and back again to Lisbon. Everyone hoped to get a suntan and by Sunday, 22nd January, the vessel had entered the blue waters off the island of Martinique. Suddenly, as the daily shipboard routine began, a group of armed and uniformed men forced their way onto the bridge and pointed machine-guns at the office-in-charge. Ignoring the threat, the senior officer tried to give the alarm. For his courage, he was shot in the back and killed. The purser was also shot at in the struggle and was seriously wounded. At this, the rest of the officers and men surrendered. At gunpoint, they were told to change course and make for an unstated destination. While they did so, the leader of the take-over group – an elderly, distinquished-looking man – went to see the master of the liner, Captain Simoes Maia, who was resting in his cabin. He introduced himself as Captain Henrique Galvao, one of his country’s most notorious men. 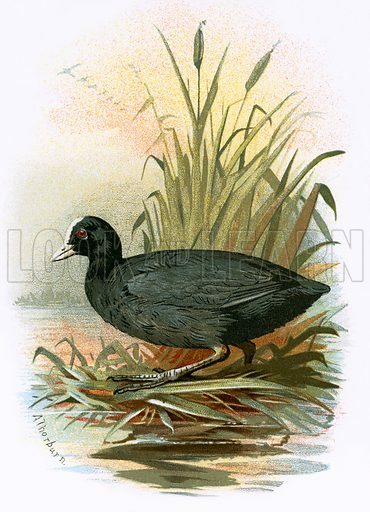 Coots spend most of their lives in water. They even build their nests floating in shallow water or resting on a half-submerged branch, hidden among the lake reeds. In spite of their comical plump bodies and huge splayed feet, they are aggressive birds. Intruding birds are loudly and fiercely attacked. This edited article originally appeared in Look and Learn issue number 901 published on 28 April 1979. Click on a picture to find out more about licensing images for commercial or personal/educational use. We are also able to license textual material. Please contact us for details. On eider farms in Iceland and Scandinavia, the famous eider-down is used to make quilts, being plentiful and easy for men to collect. This fine down is mottled brown, being plucked from the breast of the female duck to line the nest. The drake is black and white, and both have a distinctive streamlined head with no forehead bulge, the bill joining it almost in a straight line. 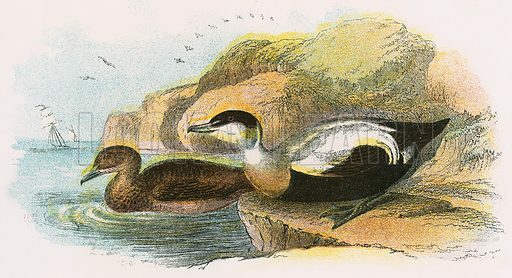 These birds are often seen diving for molluscs in heavy seas. When the Pharaoh is offended by his servants he punishes them, and on one occasion both his butler and his baker are confined at the same time in the house belonging to the captain of the guard, responsible for the prison where Joseph is being held. He gives Joseph the task of looking after them, and during this time each is troubled by disturbing dreams. When he sees them both so disturbed, Joseph asks them to recount their dreams, and each is interpreted by Joseph according to its symbols and true meaning. The butler’s dream augurs well, which encourages the baker to tell his, but Joseph’s interpretation of the latter’s dream is fateful and unwelcome. 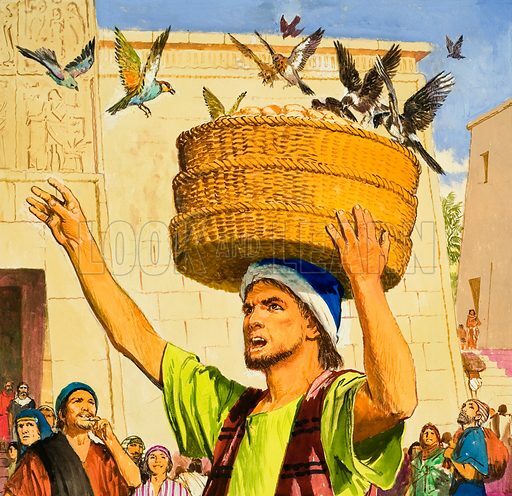 The three baskets of food for the Pharaoh on his head, and the birds eating from them, signify his imminent demise – his head will be lifted, but his body will be hung up for the birds. And the butler was given his job back, but the baker was hanged. Many more pictures relating to Joseph and the Bible can be found at the Look and Learn picture library. Click on the link or picture to find out more about licensing images for commercial and educational use. Judas Iscariot leads the enemies of Jesus to the Mount of Olives and the garden at its foot, Gethsemane, where He is praying some way apart from his disciples. It is there that he kisses Christ, thereby revealing His identity, and the chief priests, scribes and soldiers take Him into custody. After the betrayal comes the payment – thirty pieces of silver. No more contemptible sum of money exists in the annals of history. Not long afterwards, Judas is filled with remorse and returns the payment. He then hangs himself. The Temple authorities decide against putting the money in the treasury, and according to St Matthew buy the Potter’s Field which later becomes a burial ground for foreigners. Many more pictures relating to Judas and the Bible can be found at the Look and Learn picture library. Click on the link or picture to find out more about licensing images for commercial and educational use. Intreat me not to leave thee, or to return from following after thee: for whither thou goest, I will go; and where thou lodgest, I will lodge: thy people shall be my people, and thy God my God. 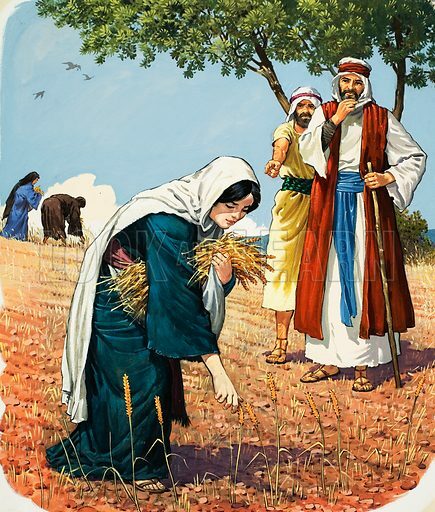 They go back to Bethlehem where Ruth gleans barley in the harvest to support them both, and the owner of the farmland is Boaz, a kinsman of Naomi’s husband. After several incidents, he “redeems” Ruth by taking her as his wife. It is a simple but affecting story of loyalty and faith. Many more pictures relating to Ruth and the Bible can be found at the Look and Learn picture library. Click on the link or picture for more information about licensing images for commercial and educational use. 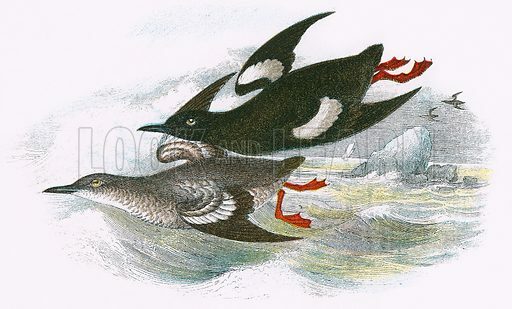 No other seabird around the coasts of Britain resembles the black guillemot in coloration. In summer it is all black except for a white patch on the wing. In winter the plumage on its back becomes barred with white and the head and underparts are mainly white. Black guillemots nest in cavities among coastal rocks or cliffs. During Absalom’s ill-advised and bloody insurrection against his father, King David, many of the king’s allies, advisers and friends found themselves in grave danger. Informers tipped off the enemy forces, while intelligence about Absalom’s intentions and military plans was essential to the king. Two of his priests, Zadok (made famous by Handel’s great Coronation Anthem) and Abiathar, hoped to use their two sons, Ahimaaz and Jonathan, to carry vital information acquired from Hushai in Jerusalem back to the king; he was to cross the river Jordan with his people, and not tarry in the wilderness where he would be attacked. 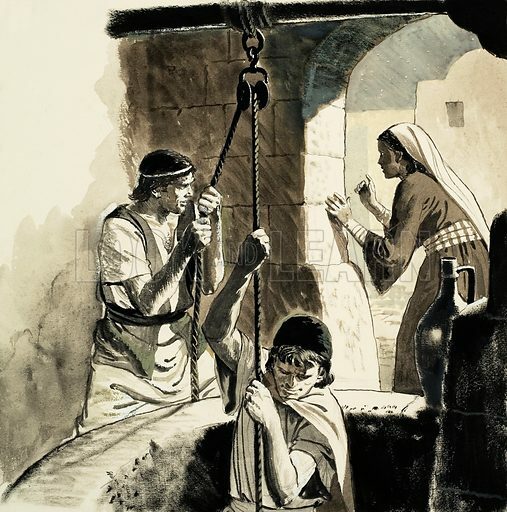 Absalom became aware of their presence thereabouts, and on his search for them even visited the house where they were hiding in an old well. But the woman of the house deceived Absalom, saying they had crossed the water, and they were able to take the urgent news to King David, who led his people across the river Jordan. Many more pictures relating to King David and the Bible can be found at the Look and Learn picture library. Click on the link or picture for more about licensing images for commercial and educational use.